Custom printed summer camp t-shirts serve are a great item to provide campers and serve multiple purposes. The best part if done correctly is to build the cost of the shirt into the fee for the camp. Whether it’s a recreational summer camp, summer sports camp, or just a local municipal camp, the cost of the t-shirts can be built into the registration fee and the ROI (return on investment) with any t-shirt marketing, can be huge. There is no better way to market your summer camp than having a few hundred kids running around town with your camp plastered all over the shirt. Over the years we have printed summer camp t-shirts for all kinds of camps ranging from high school and college sports camps to equestrian camps, band camps, vacation bible schools, and many more. One neat purpose for custom summer camp t-shirts is that many camps will separate the different age groups or activities of the campers with different color shirts. They will color code their camp t-shirts which makes it easy for the staff to recognize and contain order within the camp with color coded shirts. So one age group will get red shirts, another age group gets yellow shirts, so and so forth. Camp counselors get a completely different color shirts so everyone knows who is who. On sports camps you have options of basic tees or performance tees. Typically performance tees are the t-shirt of choice for summer sports camps. Light fabrics are the current trend and there is nothing lighter than a performance t-shirt. 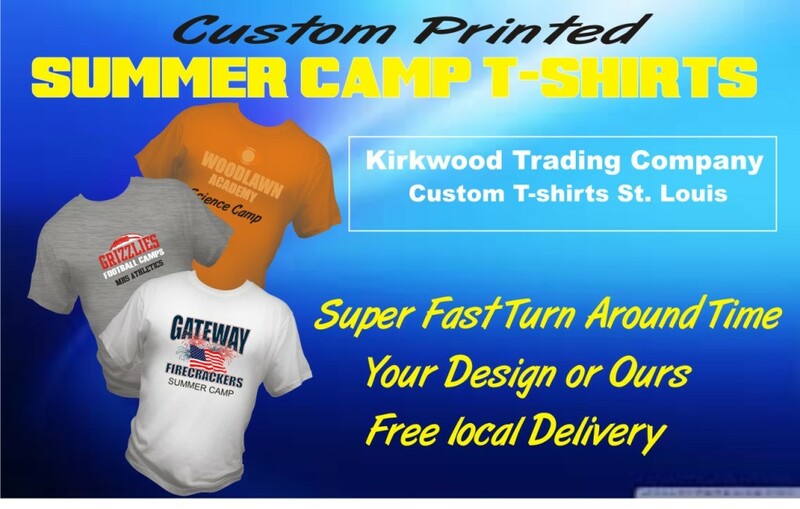 Kirkwood Trading Company (http://kirkwoodtradingcommpany.com) can assist you with all your summer camp t-shirt needs. If you have a design already, great! If not we can assist you and create a truly one of a kind design to fit the needs of your specific camp. We understand many of our clients are great at other things and sometimes not so much with shirt designs. No problem, we are glad to help. If you are interested in learning more about custom summer camp t-shirts, contact us and we will be happy to speak with you on your needs and see where we can come in and make them a custom t-shirt to remember.